Turtle tanks can start to smell swampy if you don't clean them regularly. The smell factor increases exponentially with the turtles population, and the tank size plays a role, too. Regular maintenance not only keeps your tank odor-free, it also keeps your turtles healthy. Use a skimmer net to remove any leftover food floating on the surface of your turtle tank at the end of the day. Greens in particular can clog up your filter and prevent adequate circulation. They can go bad quickly, making them smell and making them bad for your turtle if he eats them. Turtle food pellets often disintegrate if they’re in water too long, as can brine shrimp and small feeder fish -- so if decaying food is floating around that your turtles didn't eat at feeding time, scoop them up and throw them away. Some turtle owners opt to feed from a dish to avoid this problem. Your turtle will regularly shed the skin from his shell, or skutes. Unlike other reptiles that shed in an entire piece, turtles will look like they have thin, tissuelike fibers peeling from their bodies. This is normal for your turtle, but the extra skin floating in the tank will clog your filter just like excess food. When turtles are going through a molt, be extra-diligent about skimming and disposing of the shed materials. If you have a land area as well as wet area, remove any feces you see daily to cut down on odors. Make sure your turtle tank is the right temperature. Most semi-aquatic species thrive on a water temperature of 70 to 80 degrees Fahrenheit, paired with a dry, light-heated basking area where they can dry out their shells periodically. Appropriate temperature is important not only to keeping odor under control but to your turtle's health. A tank that's too hot will begin to grow algae quickly, which can contribute to bad smells, and the overly warm environment can contribute to shell rot. Do a partial water change at least once a week by removing about a quarter of the water and replacing it with non-chlorinated water of the same approximate temperature. 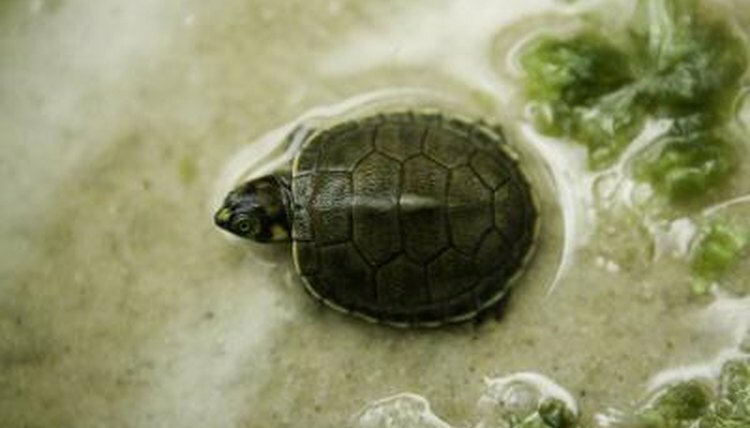 Ask your vet about using a nitrifying bacteria to help break down turtle waste and reduce smells. Do a complete tank cleaning every few weeks, removing old substrate, washing the tank with a reptile-safe cleaning agent and hot water. Use caution in handling your turtles and tank, and always wash your hands, cleaning materials and cleaning surfaces thoroughly with an antibacterial agent when you're finished. Turtles can carry salmonella, and antibacterial agents will help protect you from this disease. If you have a dry tank with a tortoise or box turtle, use a reptile sand or dirt scoop to regularly remove feces and uneaten food from the tank. Add replacement substrate as needed and wash and replace the entire substrate every few weeks.